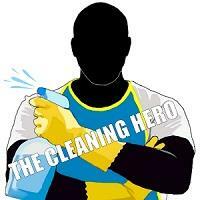 The Cleaning Hero (Durham Oven Cleaners) - Cleaning Services based in Ferryhill, County Durham. The Cleaning Hero, Durham Oven Cleaning, are Award Winning Eco Friendly Oven Cleaning Specialists, based in County Durham. The Cleaning Hero Team members, Sarah and Stevenson St Juste have over 30 years combined experience and qualifications in both the Cleaning and Customer Service Industry. They use only Non Caustic, Eco Friendly Products which allow the oven to be used immediately after being cleaned, causing no risk to pets or humans. Here is a list of services offered (other services may be available - just ask!) They are happy to discuss your requirements and tailor a service to you! Professional Oven Cleaning - Single, Double, Grills, Aga's, Range, RangeMaster, Leisure, Companion ovens, Cookers, Stoves, Freestanding, Integrated etc any oven you have can be cleaned! Hob Cleaning - Gas, Electric, Ceramic, Induction, Any Kind! Commercial Kitchens / ovens steamed clean - get in touch for a quote. We cover a 60 mile diameter area, and we always try to schedule your oven clean in as close as possible to the day / time that you need it doing.